If I had a penny for every time I make this side dish in the Fall and Winter months... seriously, my family cannot get enough of it. As Spring slowly approaches, that will change; which means I need to document this. My children ask for this like they are asking for Mac-n-Cheese. I know it's hard to believe, but this dish really is that good and comforting. The cabbage is braised with apples, honey, and red wine vinegar, so there is a perfect balance of sweet and sour. After braising the cabbage for 1 1/2 to 2 hours--it just melts in your mouth. Serve as a side to any roast meat or those Swedish Meatballs and I bet you will come back for more. So simple--so good! In a large bowl filled with cold water, immerse the sliced cabbage. Set aside. Melt the butter in a large dutch oven over medium heat. Add the onion and sauté for 5 minutes. Lift the cabbage from the water and add it to the onions. Add the sliced apple, vinegar, honey, and salt; toss to combine. Reduce the heat to medium-low. Cover the pan and cook for 1 1/2 to 2 hours, stirring occasionally. Enjoy! i just bought a huge red cabbage yesterday and this looks and sounds so delicious ! thanks for posting! 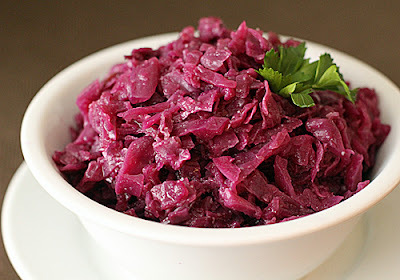 LOVE red cabbage - One of my favorite things I ate when I was in Germany! Can't wait to try this recipe! I am so glad to hear from other red cabbage lovers! Thanks for stopping by. I made a very similar dish for Thanksgiving, it was so good and was the most affordable recipe on my menu. Your version looks so delicious! Thank you:) It certainly is an affordable recipe. Lots of taste without a lot of money. I made this AGAIN last night! It's becoming a staple for our weekly dinners :)Oh and I agree with Megan ~ super affordable and sooooo easy to make! I am so glad you enjoyed it and with a baked potato--yum:) Thank you for letting me know. I finally had a chance last night to make this. Absolutely DELICIOUS!!!! I will be making it often! Looks like everyone loves this recipe, will also give it a try. What if you don't have a dutch oven? Can you use any other type of pan? Yes, any large heavy bottom pot. Looks real good! I will take a pot to pot luck and see how well it's received. Pete.